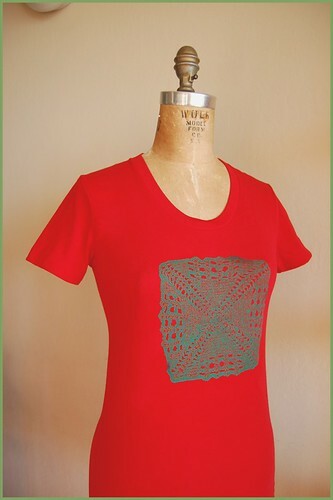 i made this doily-emblazoned tee in my silkscreening class. the class ended yesterday. so sad, because i LOVE silkscreening and want to do more of it. even more sad, i lack space in my current (minscule) pad to do it right now. perhaps in a new place, should we move (we're looking for a new, hopefully larger apt. where i can hopefully have a larger, more suitable home studio). the crocheted/felted granny blanket project is also coming along! all the squares (144 of 'em!) are finished, all ends have been woven in. yay! i took some extra squares (i made several more than i needed) and made a sample, using the techniques that i intend to use for the blanket itself, i.e., how i am going sew it together/edge it. i felted it in the washing machine with some towels to help with agitation. i gotta say, i think it's gonna turn out pretty amazing! next step: sewing the whole blanket together, square by square, then edging it. then, of course, felting it...and DONE. woot! the end is totally in sight now. 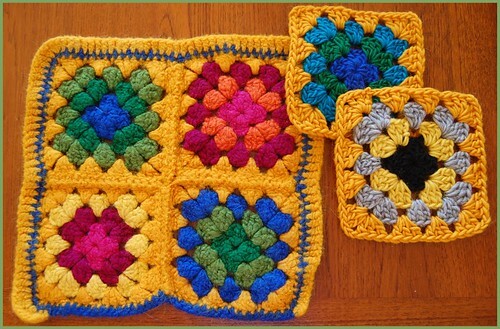 some unfelted squares are on the right for comparison between how the squares look felted vs. unfelted. as for that border color, i only used blue b/c it was readily available in the stash, but...i'll probably use some other color, maybe orange, pink, red, aqua blue....purple? anything but royal blue. :P i don't completely dislike royal blue as a color, but it's not at the top of my list of faves.